In business, a stakeholder is any individual, group, or party that has an interest in an organization and the outcomes of its actions. Common examples of stakeholders include employees, customers, shareholdersStockholders EquityStockholders Equity (also known as Shareholders Equity) is an account on a company's balance sheet that consists of share capital plus retained earnings. It also represents the residual value of assets minus liabilities. By rearranging the original accounting equation, we get Stockholders Equity = Assets – Liabilities, suppliers, communities, and governments. Different stakeholders have different interests, and companiesCorporationWhat is a corporation? A corporation is a legal entity created by individuals, stockholders, or shareholders, with the purpose of operating for profit. The creation involves a legal process called incorporation where legal documents containing the primary purpose of the business, name, and location often face tradeoffs when trying to please all of them. 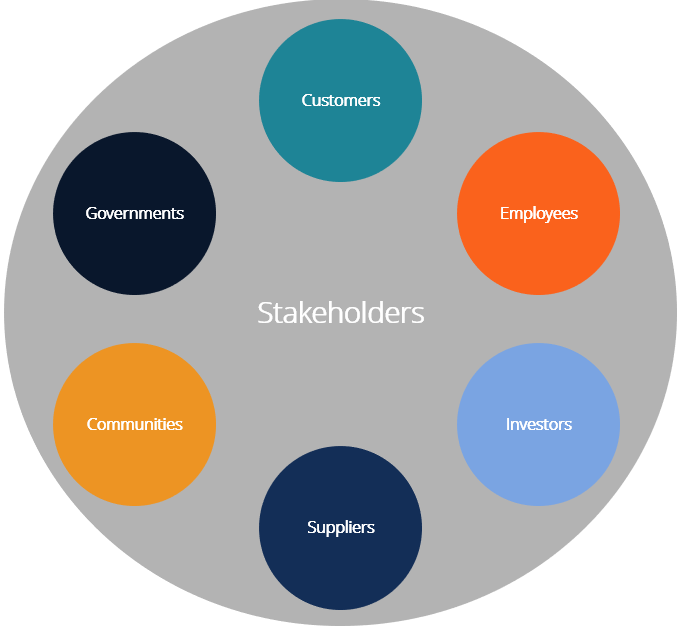 This guide will analyze the most common types of stakeholders and look at the unique need that each of them typically has. The goal is to put you in the shoes of each type of stakeholder and see things from their point of view. Many would argue that businesses exist to serve their customers. Customers are actually stakeholders of a business in that they are impacted by the quality of service and its value. For example, passengers traveling on an airplane literally have their lives in the company’s hands while flying with the airline. Employees have a direct stake in the company in that they earn an income to support themselves, as well as other benefits (both monetary and non-monetary). Depending on the nature of the business, employees may also have a health and safety interest (for example, transportation, mining, oil and gas, construction, etc.). Investors include both shareholders and debtholders. Shareholders invest capital in the business and expect to earn a certain rate of return on that capital. Investors are commonly concerned with the concept of shareholder valueShareholder ValueShareholder value is the financial worth owners of a business receive for owning shares in the company. An increase in shareholder value is created with a company earns a return on invested capital greater than its weighted average cost of capital. Value is created when the business performs better than expected. Lumped in with this group are all other providers of capital, such as lendersTop Banks in the USAAccording to the US Federal Deposit Insurance Corporation, there were 6,799 FDIC-insured commercial banks in the USA as of February 2014. The country's central bank is the Federal Reserve Bank, which came into existence after the passage of the Federal Reserve Act in 1913 and different classes of shareholders. Suppliers and vendors sell goods and/or services to the business and rely on it for revenue generation and on-going business. In many industries, the suppliers also have their health and safety on the line, as they may be directly involved in the company’s operations. Communities are major stakeholders in large businesses. They are impacted by a wide range of things, including job creation, economic development, health, and safety. When a big company enters or exits a small community, they will immediately feel the impact on employment, incomes, and spending in the area. In some industries, there is a potential health impact, as companies may alter the environment. Governments can also be considered a major stakeholder in a business as they collect taxes from the company (corporate income), as well as from all the people it employs (payroll taxes) and other spending the company incurs (goods and services taxes). Governments benefit from the overall Gross Domestic Product (GDP) that companies contribute to. Companies often struggle to prioritize stakeholders and their competing interests. Where stakeholders are aligned, the process is easy. However, in many cases, they do not have the same interests at stake. For example, if the company is pressured by shareholders to cut costs, it may lay off employees or reduce their wages, which presents a difficult tradeoff. Read more about Jack Ma’s stakeholder priorities here. Many other CEOs also tout shareholder primacy as their number one interest. Much of the prioritization will be based on the stage a company is at. For example, if it’s a startup or an early-stage business, customers and employees are more likely to be first. If it’s a mature publicly traded company, shareholders are likely to be first. At the end of the day, it’s up to a company, the CEOCEOA CEO, short for Chief Executive Officer, is the highest-ranking individual in a company or organization. The CEO is responsible for the overall success of an organization and for making top-level managerial decisions. Read a job description, and the board of directors to determine the appropriate ranking of stakeholders when competing interests arise. This is an important distinction to make. A stakeholder is anyone who has any type of stake in a business, while a shareholder is someone who owns shares (stock) in a business and thus has an equity interest. Shareholder PrimacyShareholder PrimacyShareholder primacy is a shareholder-centric form of corporate governance that focuses on maximizing the value of shareholders before considering the interests of other corporate stakeholders, such as the society, community, consumers, and employees.